PROPERTY developer Emkay Group expects to launch an affordable housing project in Cyberjaya by the second quarter of next year in an effort to enhance the middle-income group's accessibility to their own house. "This is an ongoing effort by us in providing affordable housing to the people, in line with the government's desire to see more of the middle income group owning homes," said chairman Tan Sri Mustapha Kamal Abu Bakar. He said although the project is still in the planning stage, the company expects it to include the development of about 3,000 units of medium cost houses with a selling price of below RM200,000 a unit. Speaking to reporters after the launch of the Star Central @Cyberjaya project here yesterday, he said the affordable housing project will be part of the group's plan to transform Cyberjaya as Malaysia Silicon Valley in 2020. Also present was Emkay chief executive Ahmad Khalif Mustapha Kamal. The Star Central @Cyberjaya project, developed by its subsidiary, Joyful Star Sdn Bhd is a mixed-development project comprising 859,118 sq ft of office space, 814 units of shops and 1,900 residential units with a gross development value (GDV) RM1.8 million. The construction is scheduled to start next month and is expected to be completed in five years. It will be developed in four phases, Mustapha Kamal said. "So far, the project recorded a sales value of RM122 million, involving various types of development," he said. 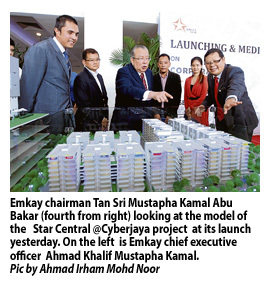 Among the development in the Star Central @ Cyberjaya project are an eight-storey semi-detached office tower units with a GDV of RM420 million, two 25-storey residential studio and office (SOHO) towers (GDV of RM319.4 million), 10-storey shop office (GDV of RM80.8 million), six-storey hypermarket (GDV of RM277.7 million), 48-storey serviced apartments (GDV of RM453.9 million) and a 41-storey hotel (GDV of RM332.2 million). The company will utilise the Industrialised Building System in order to reduce construction costs, Mustapha Kamal said, without revealing more details about the project. "We do not want to be too dependent on foreign labour services to build affordable homes in Cyberjaya," he said. Commenting on the proposed tax incentives for developers who use the IBS and green technology, he said if the government announces it in the Budget 2013 today, the company plans to build more affordable homes in Cyberjaya. "It is possible (to build more affordable housing) based on Emkay track record so far," he said. So far, Emkay has already built 22,920 units of affordable housing since 1990 with a GDV of RM1.37 billion. From the total, 11,118 units are located in Damansara Damai, Petaling Jaya and 11,794 units in Taman Bunga Raya, Bukit Beruntung.